Despite growing threats of space warfare, the Pentagon's plan to create a new military branch called the Space Force faced tough questioning on Capitol Hill Thursday from both Republicans and Democrats who voiced concerns about costs, increased bureaucracy, and impact on military readiness. Senate Armed Services Committee Chairman Sen. Jim Inhofe (R., Okla.) told a hearing of senior military and defense officials that future conflicts with Russia and China will involve attacks "from, in, and through space." "This would profoundly disrupt our society which is heavily dependent upon satellite communication, positioning, navigation and timing, and other vital space-based technology," he said. "We must restore our margin of dominance in space over our adversaries." Inhofe, however, noted that when he first heard about the creation of the new military service he asked what the branch would fix and how much it would cost. "I have yet to get satisfactory answers on either one of these," he said. "It is highly unlikely that the bureaucracy of the Space Force will remain flat over time," said Sen. Jack Reed (D., R.I.), the committee's ranking member. "I think providing [the Defense Department] with wide legislative authority to create a new proxy without more robust budget details is risky." The strongest advocate for the Space Force at the hearing was Marine Corps Gen. Joseph Dunford, chairman of the Joint Chiefs of Staff, who testified that unlike the past when military shifts were made after a failure, going forward with a new Space Force will allow the military to prepare in advance for a space conflict that could be devastating. Dunford said the military has conducted joint net assessments—military evaluations of U.S. and adversary forces—to gauge the ability of the military to fight in space. They revealed "our competitive advantage in space has eroded," he said. "China and Russia have taken significant steps to challenge our traditional dominance in space," the four-star general said. "China and Russia are also capable of searching, tracking, and characterizing satellites in all the earth orbits in support of space and counterspace operations." Chinese and Russian space weaponry and capabilities include electronic jamming, cyber operations, directed energy weapons, orbiting killer satellites, and ground-based anti-satellite missiles. "We have an opportunity to look to the future and posture ourselves to seize and hold the high ground of space," Dunford said. Dunford told senators the Space Force is needed to be able to train and equip forces for space warfare by combining space elements from the Air Force, Army, and Navy. Dunford defended the need for the Space Force when questioned by one senator on whether spending money and resources on a new service would lessen efforts to bolster overall military readiness weakened by nearly $600 billion in defense cuts during the administration of President Barack Obama. 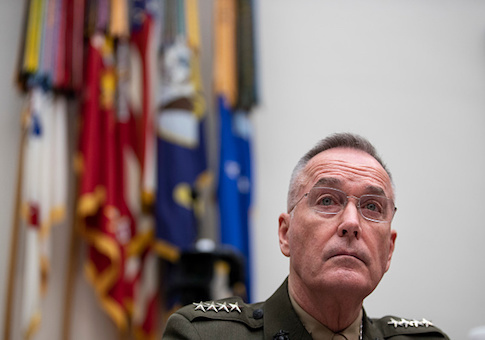 Military readiness at the squadron and battalion level will "amount to naught," Dunford said, if the military is unable to defend space that is vital for command-and-control, intelligence, surveillance, reconnaissance, precision munitions, and timing of weapons systems. "I actually now have come to much better appreciate, as a result of our analytic work, the interdependencies on space and the fact that this whole issue of the Space Force really is, in my judgment, related to readiness," Dunford said. Almost completely absent from discussion during the hearing was what kind of weapons and capabilities the military will develop and field for the Space Force. Currently, the United States has no space weapons. However, current systems could be adapted, such as cyber warfare and electronic warfare capabilities; missile defense interceptors that could be turned into anti-satellite (ASAT) missiles; high-powered lasers that can be trained on satellites to blind or destroy enemy satellites; and small co-orbital satellites used in the past by NASA for close inspection operations in space that could be turned into killer ASAT robots. The Pentagon tested an air-launched ASAT missile fired from an F-15 jet in the 1980s, and in 2008 the Navy destroyed a falling National Reconnaissance Office satellites with a modified SM-3 anti-missile interceptor. Several high-powered lasers also were developed or near deployment in the past that could be adapted for attacking satellite sensors and electronics. In 2009 and 2010, the Air Force launched two small satellites that conducted flybys of U.S. early warning satellites. The experiment, detailed in a recent report by the Secure World Foundation, was similar to the small, maneuvering satellites tested by both China and Russia that are believed to be part of space warfare programs. China's maneuvering satellites were disclosed in a July 2013 launch of three small orbiters, identified as Chuang Xin-3 (Innovation-3); Shi Yan-7 (Experiment-7); and Shi Jian-15 (Practice-15). Shi Jian-15 was described by U.S. officials as having a robotic arm capable of grabbing or crushing satellites in orbit. The military and defense officials along with several senators expressed alarm at the dangers posed by foreign space warfare capabilities, most of which remain secret. "Both China and Russia have weaponized space with the intent to hold American capabilities at risk," said Acting Defense Secretary Patrick Shanahan. "Every member of this committee has access to the classified threat picture but the bottom line is the next major conflict may be won or lost in space." Shanahan urged creation of the Space Force in order to rapidly counter the Chinese and Russian space warfare threats. "The status quo is not sufficient," he said. "We need to outpace threats in space, not simply keep up with them. Because our current system isn't organized to move fast enough, the Space Force will consolidate, elevate, and focus our efforts for results." The acting defense chief said the need is urgent because in the coming years "there is going to be literally explosion of thousands of satellites" launched. Several senators noted that much of the expertise for space defense resides within the National Reconnaissance Office, the once-secret intelligence agency that builds and launches spy satellites. Yet NRO was excluded from plans for the new Space Force and Space Command. Officials testified that adding NRO would slow the process of creating a new Space Force, but did not explain why. NRO is widely viewed within the U.S. intelligence community as an agency that is highly protective of its bureaucratic turf and multi-billion dollar annual budget. Sen. Angus King (I., Maine) said the new service will not involve soldiers fighting in space and will be limited to acquiring and deploying hardware. "I think Space Command makes sense," King said. "I understand that. But to create a new bureaucracy that's going to cost us half a billion dollars a year, I've got to be convinced that there is some incremental value there." Sen. Tom Cotton (R., Ark.) also questioned the Space Force. "I think what a lot of us on the committee are trying to figure out is what's the incremental advantage of having a separate Space Force like the Marine Corps is to the Navy within the Air Force, as opposed to say, the Air Force having the training and equipping function that the five services have for the geographical commands, Central Command or European command or so forth," he said. Air Force Gen. John Hyten, commander of the Strategic Command, was asked about India's recent test of an anti-satellite missile that created some 400 new pieces of orbiting debris including 24 pieces large enough to pose a threat to the International Space Station. "I think the first lesson from the Indian ASAT is just the simple question of why did they do that. And the answer should be simple, I think to all the committee looking at it, is that they did that because they are concerned about threats to their nation from space, and therefore, they feel they have to have a capability to defend themselves in space," Hyten said. The Indian test highlights China's destructive 2007 anti-satellite missile test when a ground-launched ASAT missile blasted an orbiting weather satellite and created thousands of pieces of debris that will remain circling the earth for decades. In a joint prepared statement, Dunford and Shanahan said the Space Force would "prioritize development of appropriate defensive and offensive capabilities and doctrine to match the current and future military threats in space, as well as enhancing resilience of our space capabilities." Dunford and Shanahan stated that since the early 2000s, the government has operated on the erroneous assumption of space remaining peaceful. "A military service focused on generating and developing forces for the future is the right and necessary organizational construct to organize, train, and equip space forces," they said. "Just as the U.S. Navy ensures freedom of navigation of the seas, America must now ensure the freedom to navigate the stars." This entry was posted in National Security and tagged Space Force. Bookmark the permalink.